Cucumbers are delicious – especially when you’ve grown them yourself. They’re also really easy to grow. You’ve just got to understand that there are two main types – greenhouse and outdoor plants. Each requires a different treatment to produce a good crop. You can grow cucumbers regardless of how much space you have. They can be successfully grown in pots, growing bags or directly in the ground. Here’s how. What are the two main types of cucumber? Ridged cucumbers like these are grown outdoors. There are two main varieties of cucumber: greenhouse and outdoor. Greenhouse cucumber plants produce long, smooth fruits, much like the ones you find in the supermarket. These plants don?’t need pollinating - in fact, you should remove any male flowers to prevent pollination happening or the fruits will end up bitter. You can buy all-female F1 hybrid varieties, such as cucumber bella, so that this won’t be an issue. Outdoor varieties, meanwhile, are called ridge cucumbers. They tend to be shorter, plumper and they’ve got a rougher skin. These need to be pollinated as they produce male and female flowers. But this isn’t usually a problem as insects will most likely handle this for you! How do you grow a cucumber from seed? When you plant your seeds depends on where you plan on planting them. Cucumber seeds should be sown in a propagator between March and April. But you can get started in February if your greenhouse is heated, and in May to June if you plan to sow the seeds directly outdoors. Sow the cucumber seeds on their sides at a depth of 1cm in 7.5cm pots of free-draining, seed sowing compost. 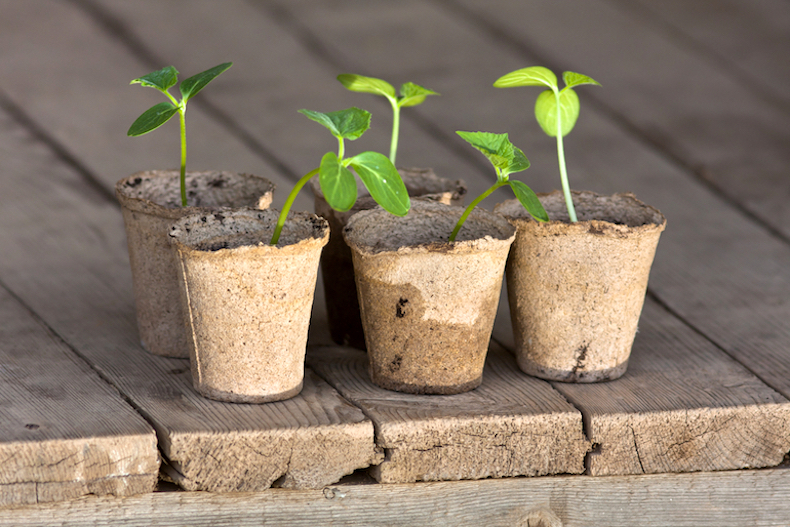 Place the pots in a propagator or seal them inside a plastic bag at a temperature of 20°C until they germinate. This usually only takes 7-10 days. 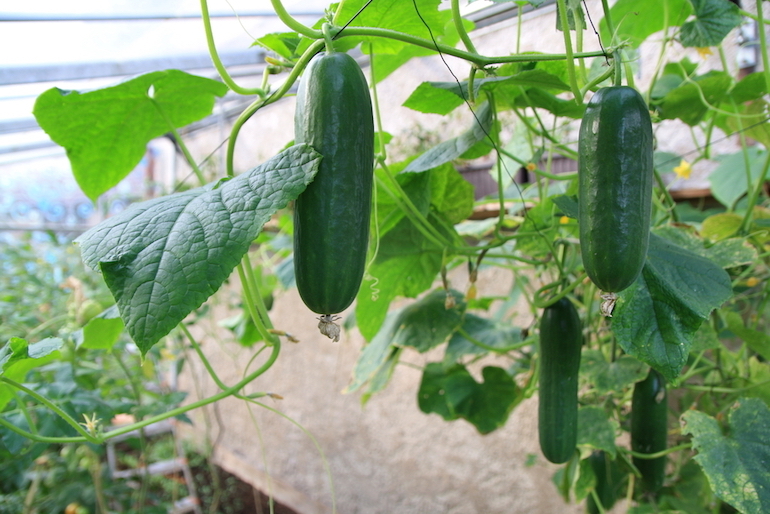 Encouraging cucumbers to climb in a greenhouse produces better yields. When do you plant greenhouse cucumbers? If your greenhouse is heated, you can plant the young plants in late March. If it’s not, wait until late May. 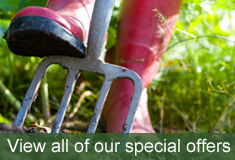 Keep the potting compost moist – the rule of “little and often” applies here. How do you plant greenhouse cucumbers? Plant two cucumber plants per grow bag, or at a distance of 45cm apart. How do you look after greenhouse cucumbers? Keep the greenhouse warm and humid by regularly spraying or damping down the pathways. 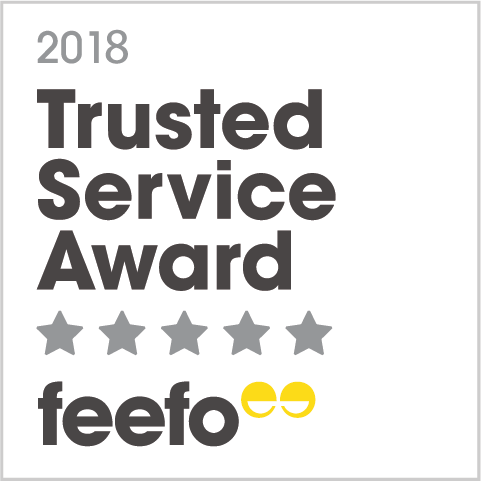 You might need to screen plants to protect them from scorching on very hot days, and a little liquid fertiliser every two weeks or so will go a long way. What should you do with trailing types? If you encourage the plants to climb, you’ll get better yields. So, train the main shoots to climb a vertical cane or string and, once they reach the end of their support, pinch out the growing point at the top of the plant. Pinch out the end of each side shoot once the fruit begins to develop, leaving two leaves after each fruit. This helps to encourage more sideshoots, which will produce bigger crops of cucumbers. What to do about male and female flowers? Always remove the male flowers from greenhouse cucumbers – you can tell they’re male because they just have a plain stalk. (Female cucumber flowers have what looks like a tiny cucumber between the bottom of the flower and the stem). Which greenhouse cucumber varieties should you try? 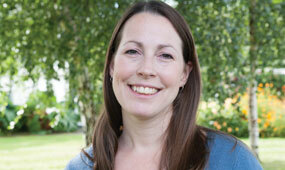 • ‘Carmen’ F1 AGM: A unique variety that’s all-female and is admirably disease resistant. The plant is easy to train in a greenhouse and produces abundant crops. • ‘Cucino’ F1 Hybrid AGM: Crisp, flavoursome mini-fruits are prolifically produced from this plant throughout the season. • Nimrod: Compact, manageable and less likely to take over than some varieties, this plant produces dark-skinned, crisp cucumbers. • Mini Munch F1 Hybrid: All-female, this variety is a particularly heavy cropper if harvested regularly. • ‘Bella’: All-female, vigorous and with a good tolerance to powdery mildew, this is a reliable variety – even in unheated greenhouses. Grown outdoors, cucumber plants can trail along the ground. When do you plant outdoor cucumbers? Ridge cucumbers should be gradually acclimatised to outdoor conditions over 7-10 days before transplanting into warm, well-drained, humus-rich soil. 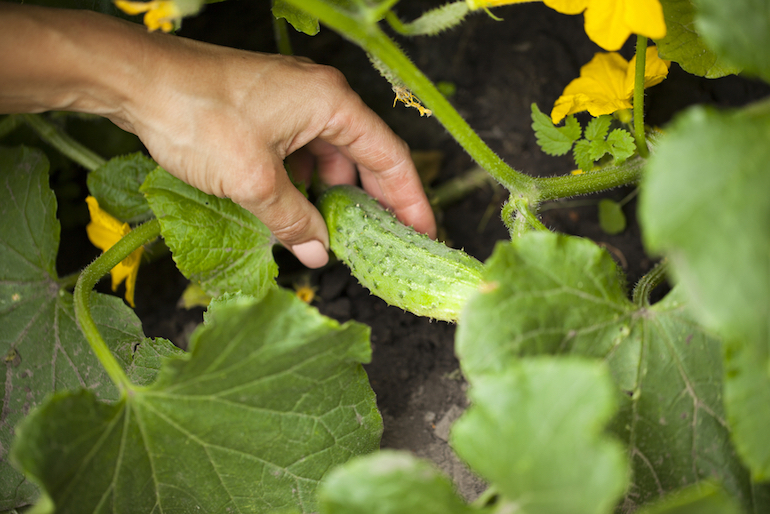 Where should you plant outdoor cucumbers? Choose a sunny position that’s sheltered from strong winds. How to plant outdoor cucumbers? Plant them in single rows 90cm apart. They won’t need training onto canes – just let them sprawl across the ground. How to look after outdoor cucumbers? Ridge cucumbers can be pinched out at the main stem after seven leaves have formed, to encourage fruiting side shoots to develop. Outdoor ridge types require pollination by an insect. The plant therefore needs both male and female flowers to be present, so don’t remove the male flowers from these varieties. Which outdoor cucumber varieties should you try? • ‘Masterpiece’ AGM: Short and straight, these cucumbers are dark-green in colour. • ‘Marketmore’ AGM: Disease-resistant, tasty, and prolific, this is a very popular variety. • ‘Crystal Apple’: A heritage variety, this plant produces prolific golf-ball-sized fruits (if picked regularly) with crisp, sweet, tender flesh. 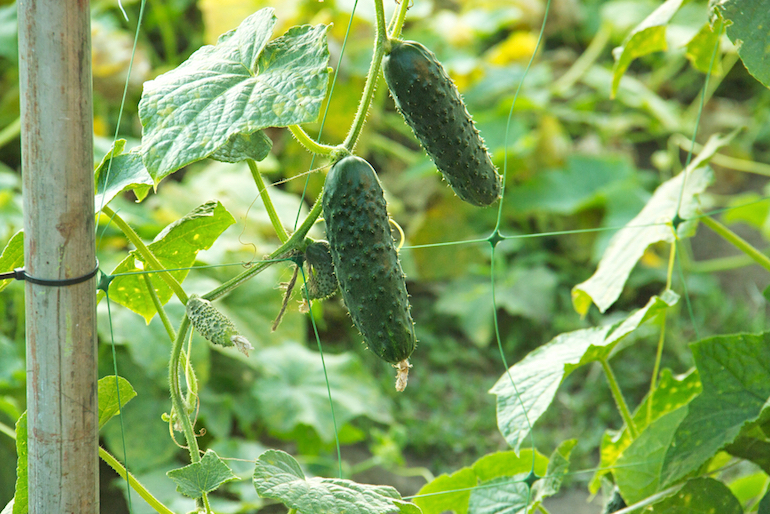 • 'Burpless Tasty Green' F1 Hybrid: High-vitamin content and flavourful, these cucumbers are crisp and delicious. • ‘Jogger’ F1 Hybrid: A reliable variety that performs well even during poor growing seasons, the fruits it produces are crisp, yet juicy, and not bitter. • ‘Goblin’ F1 Hybrid: These snack-sized mini cucumbers have a semi-trailing habit and grow well in containers. Check the variety you’ve got – some can be grown indoors or outdoors. Some varieties can be grown equally well in a greenhouse or outdoors. 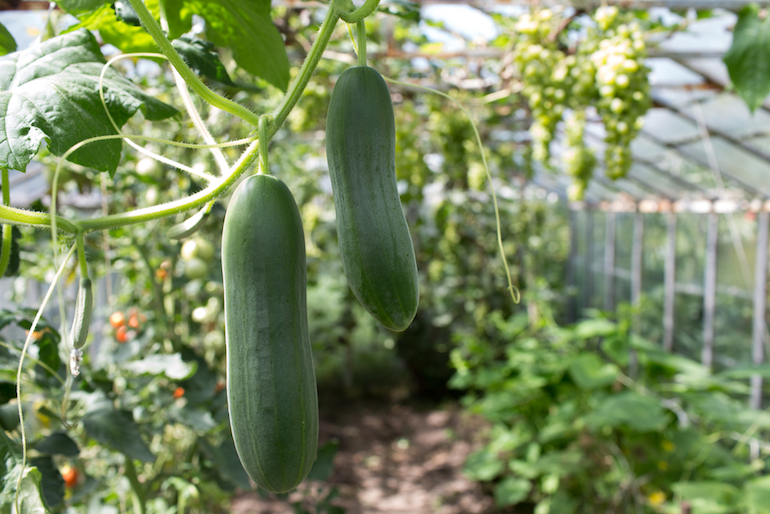 The ‘Swing’ F1 Hybrid (all female), for example, produces a heavy crop of long, crisp cucumbers that are ideal for organic gardeners. The ‘Diva’ (all-female) produces high yields of seedless mini cucumbers – perfect for snacking! The important thing to remember when choosing where to plant is that you should never grow ridge cucumbers in the same greenhouse as an ?all-female? greenhouse type; this will lead to cross-pollination, and your fruits will taste bitter. 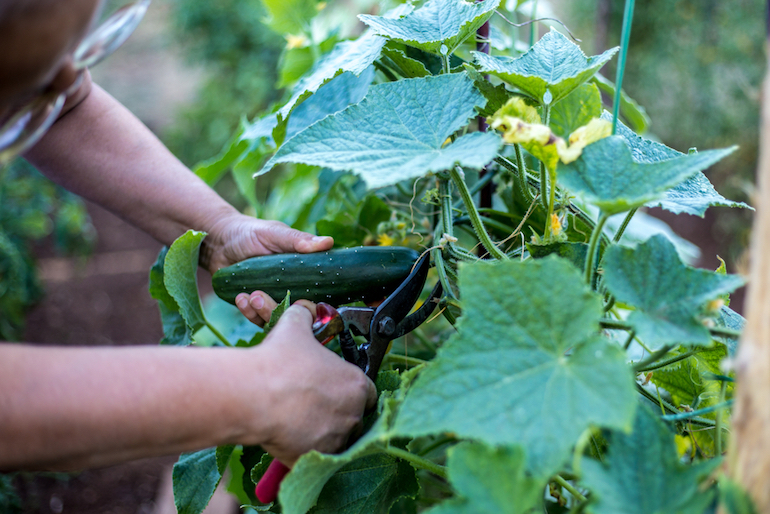 Use secateurs or a sharp knife to cut the cucumbers from the plant. 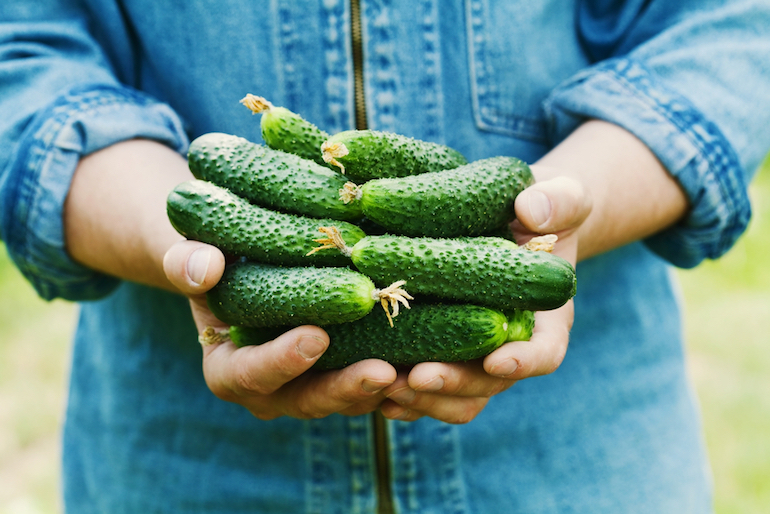 You can normally begin to harvest cucumbers around 12 weeks from sowing – how long the cucumbers are will depend on the particular variety. But it’s best to harvest cucumbers while they’re young and tender, before they show signs of producing seeds, as older fruits can become bitter. Harvesting cucumbers is best done early in the morning when temperatures are cool. Cut the fruits from the plant using secateurs or a sharp knife. Regular harvesting will encourage long continuous production. Outdoor types can continue to fruit until September, while greenhouse types can fruit into October if temperatures are warm enough. • Keep your cucumber plants well watered to help them establish and to increase yields. You want them to be moist, not wet, so little and often is best. • Feed your cucumber plants with a high potash feed every two weeks once the fruits begin to develop. • Cucumber plants like sun, but are prone to scorching, so some shade is preferable. • Encourage greenhouse varieties to climb to boost yields. • Harvest fruits early in the day while it’s cool. • Harvest frequently to get more fruits during the season. Now you know how to choose and grow the best cucumbers, you just need to find plenty of ways to eat your bumper crops. We like ours sliced into sandwiches and added to long cold summer drinks to enjoy as the sun goes down! 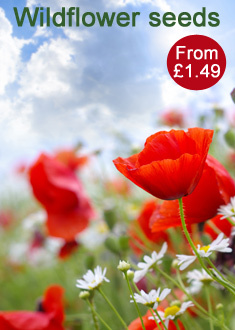 Check out our full range of salad seeds here. Happy growing.